There were television shows with simulated court proceedings in the late 1940s. There are such shows today. In the more than 50 years that these series have been on the air, there’s one that stands out. 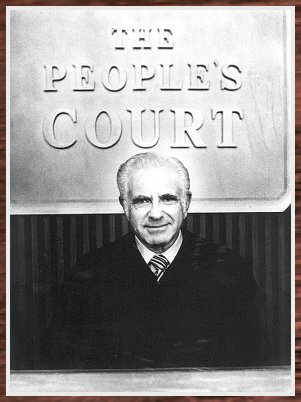 It was “People’s Court,” featuring retired Los Angeles Superior Court Judge Joseph A. Wapner as the judge. Why was “People’s Court” the foremost show of the genre? Probably because it featured retired Los Angeles Superior Court Judge Joseph A. Wapner as the judge. His Superior Court colleagues had elected him presiding judge for 1969 and 1970. Judges statewide chose him as the head of the California Judges Assn. in 1975-76. And television viewers enthusiastically embraced him, catapulting him to “superstar” status. “People’s Court” went on the air in 1981 as a syndicated show—the networks didn’t want it—and it became an immediate and resounding success. It lasted an impressive 12 seasons as a first-run show, with reruns airing for the next two years on the USA cable network. In fact, his shows were aired around the globe. How did Wapner land his television judgeship? He recounted during a recent interview that it stemmed from a conversation between one of the show’s executive producers, Ralph Edwards—host of the popular 1950s show, “This Is Your Life”—and then-Los Angeles Superior Court Judge Christian Markey (since retired). Wapner said that Markey, who had been his tennis partner for years at the annual judges’ tournaments, recommended him for the role. As Markey recounted the conversation, Edwards, whom he termed a “dear friend,” offered the role to him. “I told him I could not do it as a sitting judge, and I was not about to retire,” he said. But Wapner had recently left the bench, and he suggested that Edwards contact him. 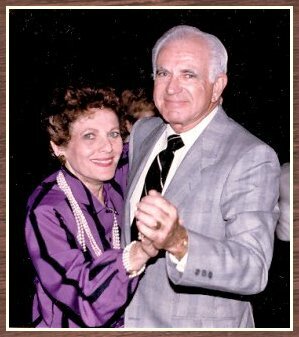 Wapner is seen with wife, Mickey, in a photo taken close to the time he was selected to portray the judge on "People's Court." He came to the production company’s office, he recalled, and presided over a case in which a woman, who was about five feet tall, 100 lbs., was suing a six-foot man, who weighed about 275 lbs., for battery. These weren’t actors. Just as on the actual show that was being planned, “real people” were there with real disputes. Wapner conducted binding arbitration in a mock small claims court setting. As Wapner recalled it, it was when he told the irate defendant to sit down and be quiet, in an authoritative tone, and the hulk complied, that the producers became impressed. Actually, executive producer Stu Billett said, he was impressed when he first encountered Wapner that day. After Wapner tested for the role, Billett said, he abandoned the idea of using alternating judges.